Heat the gowurdak in a large pot over medium heat. When the fat has melted, add the finely chopped onion. When the onion begins to soften, add the diced tomatoes and stir for a few seconds. Add the water, salt and beans. 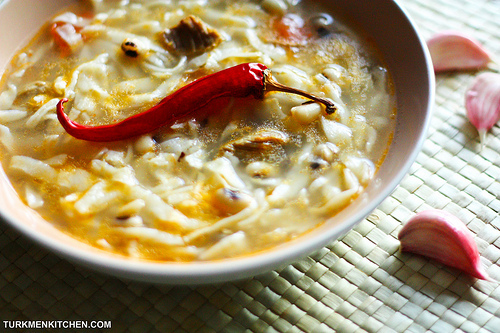 Bring the soup to a boil over high heat, then reduce the heat to medium and simmer until the beans are tender. In a large bowl, combine the ingredients to make the noodle dough. Knead until the dough becomes stiff. 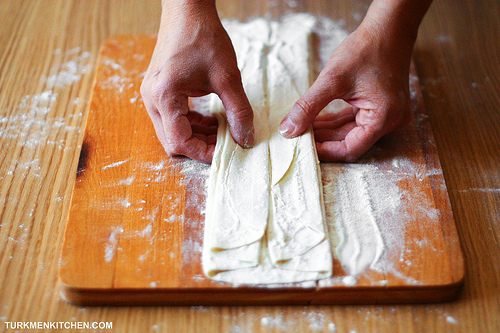 Roll the dough between your palms into a ball, cover with a kitchen towel and allow to rest for 5 minutes. Roll out the dough on a floured surface to a thickness of 2 mm. Spread a generous amount of flour evenly over the rolled out dough. Pull up one side of the dough towards the center and fold back and forth into a zigzag. Sprinkle flour between each fold to prevent the layers from sticking. Repeat with the other side. Place one hand on the folded dough as a guide and using a sharp knife, cut into thin noodles. Pick the noodles up with your hands, gently shake off the excess flour, and spread the noodles out. (Click here for step-by-step pictures). Bring the soup back to a boil, then drop in the red chile and noodles. 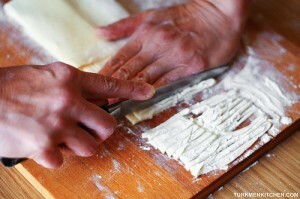 Using a wooden spoon, slowly stir the noodles 3-4 times to prevent clumping. Cook for about 8 minutes, then turn off the heat. Take out the red chile and mash it into the soup by pressing it against the side of the pot with a spoon. Add the grated garlic to the pot. Serve right away, each bowl topped with plain yogurt (optional). 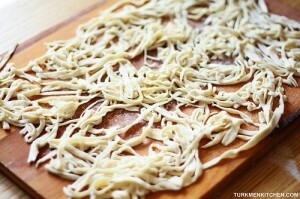 Copyright © 2011-2019 One Turkmen Kitchen. All rights reserved.